The objective of this study was to investigate the in-vitro differentiation of mesenchymal stem cells (MSCs) into cells of the endothelial lineage. All tissues depend on the blood supply, and blood supply depends on endothelial cells (ECs). Vascular ECs derived from stem cells could be used in therapeutic strategies for the repair and revascularization of ischemic tissue in patients exhibiting vascular defects. MSCs that can be separated from different tissues have the ability for self-renewal, they can be differentiated into different tissues, and they help in the regeneration of damaged tissue in tissue engineering. This study was carried out on 20 bone marrow samples. A volume of 5 ml of bone marrow was aspirated. Mononuclear cells were separated using Ficoll–Hypaque solution. MSCs were separated from the mononuclear cell fraction using plastic adherence. MSCs were subcultured in 35-mm Petri dishes and then treated with vascular endothelial growth factors. MSCs were generated out of mononuclear bone marrow cells. Isolated MSCs were positive for the marker CD44 and negative for CD34. They were able to differentiate into ECs. ECs can be identified by morphology, flow cytometric analysis to detect CD34+, and hematoxylin and eosin staining. The present study shows that bone-marrow-derived MSCs can be differentiated in vitro to ECs as future revascularization therapy in ischemic tissue. Mesenchymal stem cells (MSCs) are a heterogeneous population of stem/progenitor cells with pluripotent capacity to differentiate into mesodermal and nonmesodermal cell lineages . Stem cells have the potential to develop into mature cells that have characteristic shapes and specialized functions, such as heart cells, skin cells, or nerve cells. Stem cells can be isolated from bone marrow, adipose tissue, and umbilical cord, and they can be stored long term without major loss of potency and no adverse reactions to allogeneic MSC transplant . Vascular endothelial cells (ECs) line the entire circulatory system, from the heart to the smallest capillaries. These cells have many functions including fluid filtration, blood vessel tone, hemostasis, neutrophil recruitment, and hormone trafficking . Endothelial dysfunction is a broad pathological disorder of the endothelium, which is assigned by vasoconstriction, thrombosis, and ischemic diseases, alone or with other disorders such as coronary artery disease, hypertension, and atherosclerosis . ECs are of great interest because of their potential in cell therapy for vascular diseases and ischemic tissue, tissue engineering for vascular grafts and vascularized tissue beds, and modeling for pharmaceutical transport across endothelial barriers . MSCs can transdifferentiate into lineage with functional and phenotypic features of ECs and participate in angiogenesis directly . The present study was conducted at Department of Clinical Pathology, Faculty of Medicine, Menoufia University during the period from January 2015 to February 2016. This study was carried out on 20 bone marrow samples. Samples were aseptically collected from patients who already have indication for bone marrow examination, after obtaining written consent from them. Our scientific ethical committee approved this work. A volume of 5 ml of bone marrow was aspirated under complete sterile conditions from posterior superior iliac spin from patients undergoing bone marrow aspiration for nonmalignant reasons collected in a 15-ml sterile heparinized Falcon tube (Sharma Scientific Traders, New Delhi, Delhi). Under laminar flow, the bone marrow aspirate was diluted with sterile PBS in the ratio of 1: 1 and then layered on top of Ficoll–Hypaque solution (density 1.077 g/l). The tube was centrifuged for 20 min at 1800 rpm. The mononuclear cell fraction was collected carefully and then transferred into a sterile 15-ml conical centrifuge tube. The cells were washed twice in 5 ml of sterile PBS and spun at 1500 rpm for 10 min. The flasks were incubated in a horizontal position in a humidified incubator at 37°C and 5% CO2. The medium was changed every 4 days for removal of nonadherent cells. 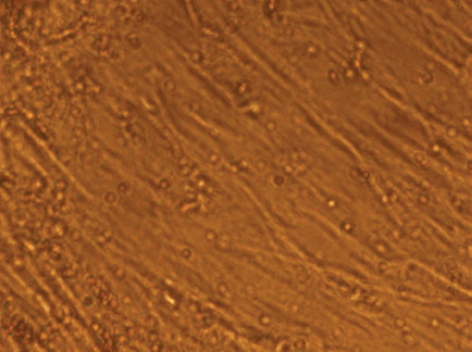 At day 9, when fibroblast-like cells reach 80–90% confluency, these cells were harvested by trypsinization. The medium was aseptically removed. A volume of 1–2 ml of trypsin–EDTA detachment solution was added. The cells were examined microscopically for detachment every 2–3 min. The time required for complete detachment was about 3–5 min. After complete detachment, DMEM containing 1% serum fetal bovine serum was added. The cells were transferred to a 15-ml Falcon tube and centrifuged at 1800 rpm for 10 min. The cells were resuspended in complete medium. Cells were examined under the microscope, counted and the viability was assessed by trypan blue staining. 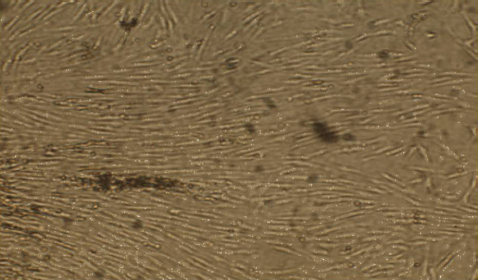 The cells were used for MSC identification and endothelial differentiation. MSCs were identified by morphology and flow cytometric analysis of surface markers CD44 and CD34. Cells were washed with PBS and centrifuged at 3200 rpm for 5 min and resuspended in 1 ml of PBS. A volume of 100 μl of cell suspension was added to 10 μl of fluorochrome-conjugated reagent phycoerythrin-conjugated anti-CD34+ 10-μl fluorescein isothiocyanate anti-CD44. Cells were then incubated in the dark for 30 min after light vortexing. Finally, cells were analyzed using a Flow Cytometer (Becton Dickinson FACSCalibur, San Jose, CA, USA) . The endothelial differentiation was induced by adding 50 ng/ml vascular endothelial growth factor (VEGF) to complete nutrient medium for 7 days. The medium was changed every 3 days and examined daily with assessment of the cell morphological changes. Hematoxylin and eosin staining: staining was performed according to Lynch et al. .
At day 7, cells showed multipolar fibroblastoid cells and a 60% confluence, which gradually increased to 80–90% confluence at about 9 days [Figure 1]. 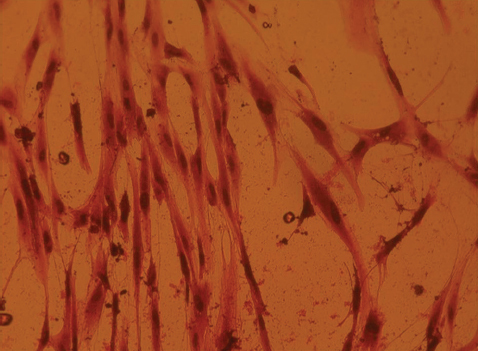 Figure 1: Inverted microscope image ×100 of adherent mesenchymal stem cells after removal of floating nonadherent cells showed 80–90% fibroblast confluence. MSCs showed positive expression of CD44 (X ± SD: 81.2 ± 12.4) and negative expression of CD34 (X ± SD: 1.97 ± 1.5) [Table 1]. MSCs induced with VEGF show spindle shape with no much morphology difference form MSCs [Figure 2]. Figure 2: Inverted microscope image ×200 of bone-marrow-derived mesenchymal stem cells cultured with vascular endothelial growth factor medium. Induced MSCs showed positive expression of CD34 (X ± SD: 83.4 ± 10.4). The harvested ECs were identified by using hematoxylin and eosin stain. The ECs appear typically spindle shaped with pink cytoplasm and blue nucleus [Figure 3]. Figure 3: Inverted microscope image ×200 of endothelial cells stained with hematoxylin and eosin. MSCs are a population of multipotent cells found primarily in the bone marrow. They have long been known to be capable of osteogenic, adipogenic, and chondrogenic differentiation. It has been proven that MSCs aid the stimulation of angiogenesis, neurogenesis, and regeneration of damaged tissue . ECs have a major role in new vessel formation. ECs are needed to line artificial vessels and to restore vascularization of ischemic tissues. This is a crucial point in therapy of peripheral vascular diseases . ECs derived from stem cells could potentially lead to a variety of clinically relevant applications. These cells could be used in therapeutic strategies for the repair and revascularization of ischemic tissue in patients exhibiting vascular defects . In the present study, change of MSC morphology was observed; after 7 days of incubation, MSCs exhibit fibroblast-like morphology. This is in agreement with the study by Oswald et al. , who demonstrated a fibroblast-like, spindle-shaped morphology that appears at day 7 after incubation. With regard to MSC identification in this study, flow cytometric analysis showed that these cells were positive for human MSC marker CD44 (81.2 ± 12.4) and negative for CD34 (1.97 ± 1.5); this is in agreement with the study by Chen et al. , who defined MSCs as being able to express CD29, CD73, CD44, CD90, CD105 antigens, and not expressing neither the hematopoietic cell markers CD34, CD45, and major histocompatibility complex class II antigen nor endothelial lineage cell marker. As regards morphological changes, cells were spindle shaped with no much morphology difference form MSCs, and this result is in agreement with the study by Siddiqui , who reported that differentiation into endothelial-like cells can be induced by cultivating confluent MSCs in the presence of 50 ng/ml VEGF for 7 days. Cell morphology showed no difference compared with undifferentiated MSCs. With flow cytometric analysis, ECs showed positive expression of CD34 (83.4 ± 10.4). This result was in agreement with the study by Liu et al. , who reported that differentiated ECs expressed endothelial markers such as CD34, CD144, KDR, CD105, CD31, and UEA-1 lectin binding. As regards hematoxylin and eosin staining, the harvested ECs appear typically spindle shaped with pink cytoplasm and blue nucleus. This morphology is the same as that found by Portalska et al. . This study showed that bone-marrow-derived MSCs can be differentiated in vitro into ECs. This opens the future for the use of MSCs for revascularization therapy of ischemic tissue. Leeper NJ, Hunter AL, Cooke JP. Stem cell therapy for vascular regeneration: adult, embryonic, and induced pluripotent stem cells. Circulation 2010; 122:517–526. Parekkadan B, Milwid JM. Mesenchymal stem cells as therapeutics. Annu Rev Biomed Eng 2010; 12:87–117. Kim S, von Recum H. Endothelial stem cells and precursors for tissue engineering: cell source, differentiation, selection, and application. Tissue Eng Part B Rev 2008; 14:133–147. Tao H, Han Z, Han ZC, Li Z. Proangiogenic features of mesenchymal stem cells and their therapeutic applications. Stem Cells Int 2016; 2016:1314709. Oswald J, Boxberger S, Jørgensen B, Feldmann S, Ehninger G, Bornhäuser M, Wernera C. Mesenchymal stem cells can be differentiated into endothelial cells in vitro. Stem Cells 2004; 22:377–384. Rufflo A, Stamenkovic I, Melinck M, Seed B, Underhill CB. CD44 is the principal cell surface receptor for hyaluronate. Cell 1990; 61:1303–1313. Lynch MJ, Raphael SS, Mellor LD, Spare PD, Inwood MJ. Medical laboratory technology and clinical pathology. 2nd ed. London: W. B. Saunders Company; 1969. Ahmedy EA, Kandel SH, Rizk SH, Hala M, Gabr HM, Khalifa KA, Kamal SM. Methods and applications for mesenchymal stem cells. Menoufia Med J 2013; 26:71–77. Zampetaki A, Kirton JP, Xu Q. Vascular repair by endothelial progenitor cells. Cardiovasc Res 2008; 78:413–421. Pati S, Gerber MH, Menge TD, Wataha KA, Zhao Y, Baumgartner JA, et al. Bone marrow derived mesenchymal stem cells inhibit inflammation and preserve vascular endothelial integrity in the lungs after hemorrhagic shock. PLoS One 2011; 6:e25171. Chen MY, Lie PC, Li ZL, Wei X: Endothelial differentiation of Wharton's jelly-derived mesenchymal stem cells in comparison with bone marrow-derived mesenchymal stem cells. Exp Hematol 2009; 37:629–640. Siddiqui IA. In vitro differentiation of mesenchymal stem cells into endothelial cells. Der Pharmacia Sinica 2013; 4:106–112. Liu JW, Dunoyer-Geindre S, Serre-Beinier V, Mai G, Lambert JF, Fish RJ, et al. Characterization of endothelial-like cells derived from human mesenchymal stem cells. J Thromb Haemost 2007; 5:826–834. Portalska KJ, Leferink A, Groen N, Fernandes H, Moroni L, Blitterswijk CV, Boer JD. Endothelial differentiation of mesenchymal stromal cells. PLoS One 2012; 7:e46842.